All in Accredited Genealogists Ireland (AGI) are saddened by the death of Eileen O’Byrne, BA, BL, FAGI, FIGRS. Eileen was one of our founding members and a very unassuming, generous colleague, while being very knowledgeable about all aspects of genealogical sources and research. L-R: Then president Helen Kelly talking with former president Eileen O’Byrne at an event in Dublin Castle in 2011 to mark AGI’s 25th anniversary. Eileen qualified as a barrister and was called to the bar before raising her family. In the mid-1960s she began working as a genealogical researcher for the Genealogical Office, Dublin Castle. She was a contributor to IRISH GENEALOGY: A RECORD FINDER (1981), and she edited THE CONVERT ROLLS (1981) for the Irish Manuscript Commission. Three decades ago APGI (now AGI) was founded and she played a leading role in the development of our organisation, serving as President for three years. From 1989 Eileen was involved in the Genealogy Advisory Service, developed by the Genealogical Office in partnership with APGI. It later transferred to the National Library and a similar service was run by APGI for the National Archives. While APGI ran these services Eileen worked at all three locations, providing visitors with excellent guidance. In 2005 Eileen was elected a Fellow of both the Irish Genealogical Research Society and our own organisation, in recognition of her valuable contribution to genealogy in Ireland. In June 2012 we were delighted to be able to mark her 90th birthday at the Bedford Tower in Dublin Castle, the former home of the Genealogical Office. Eileen had the logical and insightful mind of the barrister and the true genealogist. She was always consulted on important matters to do with our organisation, being regarded by her colleagues as a rock of sense. 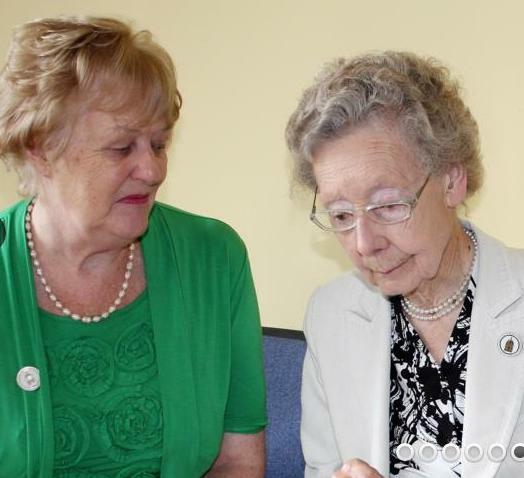 In May 2015 she attended our EGM at which we changed our name from Association of Professional Genealogists in Ireland to the more descriptive Accredited Genealogists Ireland, and she contributed to the discussion, supporting the change. Only days before her death Eileen was exercising her razor-sharp intellect at her weekly outing to her bridge club. She died on 20th January 2016.